View of a bridge, probably over the River Tawe in Glamorganshire, South Wales. In 1700 Swansea was a small costal village of just 300 people, however during the 18th century the area developed at an unprecedented growth due to the development of the coal and copper industries and the expansion of the port. 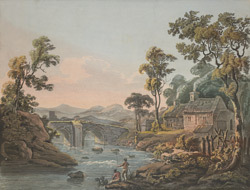 This painting was by landscape artist Thomas Walmsley (1763- 1806). Walmsley began his career as a scene painter at the Opera House in London and is known for his dramatic use of colour.